The year is 1898, the Spanish American War is drawing to a close, the gay ‘90s are still in full swing, and the U.S. economy continues to stabilize after the Panic of 1893. 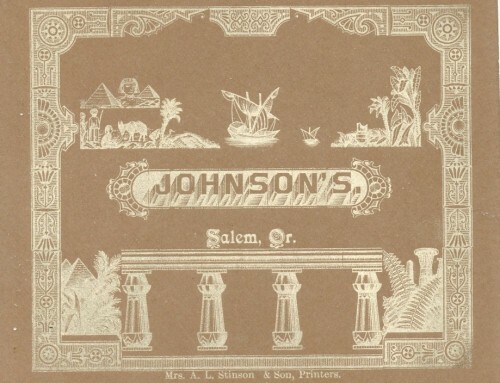 Things are on the upswing in Salem including the hotel industry, thanks to a California hotel man named John Conner. It’s a Thanksgiving to celebrate and the Hotel Willamette pulled out all the stops. 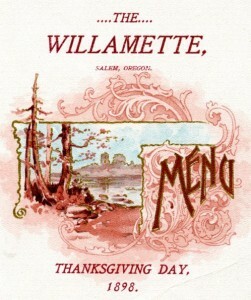 The Daily Capital Journal boasted that “Oregon can set the best Thanksgiving dinner in the world entirely of home products and that is what the spread will be at Hotel Willamette.” The menu boasted not only the traditional roast turkey with dressing and sauce, but mountain quail pie, boiled ham, oyster patties, loin spring lamb, and prime rib for the main course alone. Dessert included apple, mince, lemon and strawberry pies, three kinds of cakes, and two types of pudding. Accompanying dinner would be free wine and the hotel’s celebrated all-girl orchestra with a special musical program arranged for the occasion. All for the cheap price of 50 cents a person. Mr. Conner, proprietor of the hotel, was careful to point out that the low price should not be an indication as to the quality of the meal. The hotel originally opened in 1870 under the name Chemeketa House, valued at $125,000. After a series of owners, managers and financial mishaps through the first decade, the business ended up in the hands of Ladd & Bush bankers in 1882. A few years later banker Asahel Bush disposed of it for a mere $37,500. 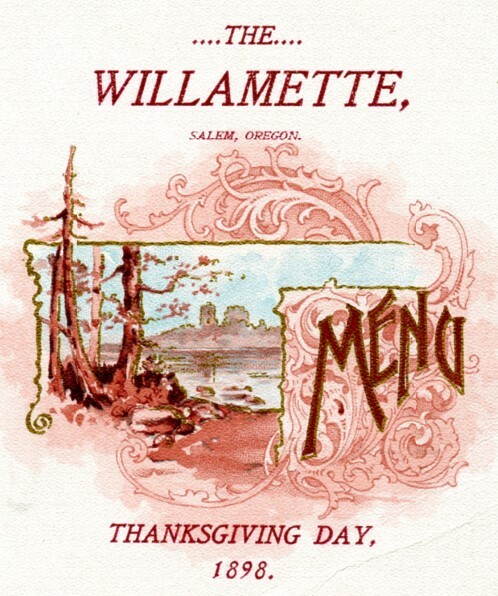 Under new management and a new name the Willamette reopened its doors in 1890. The large four story brick structure flourished under the attention of the Conner family, growing from 140 to 200 guest rooms all heated by steam, lighted with electricity, fitted with electric bells, and elegantly furnished. 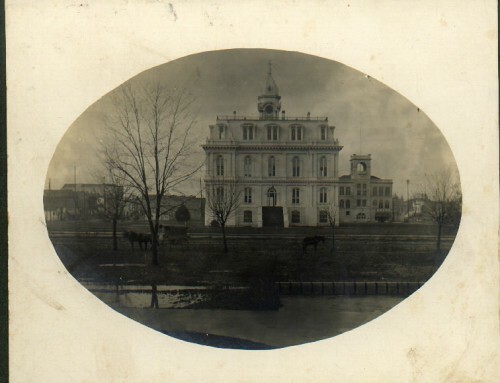 It was the second building in Salem to boast an elevator, the first being the statehouse. From 1890 to 1909, it was boasted that many political decisions and appointments were made in its high-ceilinged rooms. John Conner according to the local paper was one of the best known hotel men in the West, as well as one of the most successful. His first venture was the resuscitation of a large tourist hotel at Saratoga Springs, California, which he built up into an $100,000 property from nothing. He next revitalized the Oregon Hotel in Ashland and made it a profitable business. Then came the Willamette Hotel, which had been an elephant on the hands of nearly everybody who had tried to run it. 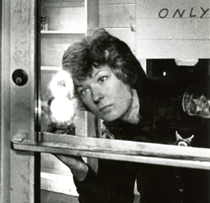 Thanks to his personal attention to every detail the property and business were valued at $200,000 within 5 years of re-opening under the Willamette name. So who was this hotel man with the Midas touch? Digging into his background proved a bit problematic because of his transitory life and common name, but we were able to find a few leads thanks to historic California voting registers and obituaries for his children. 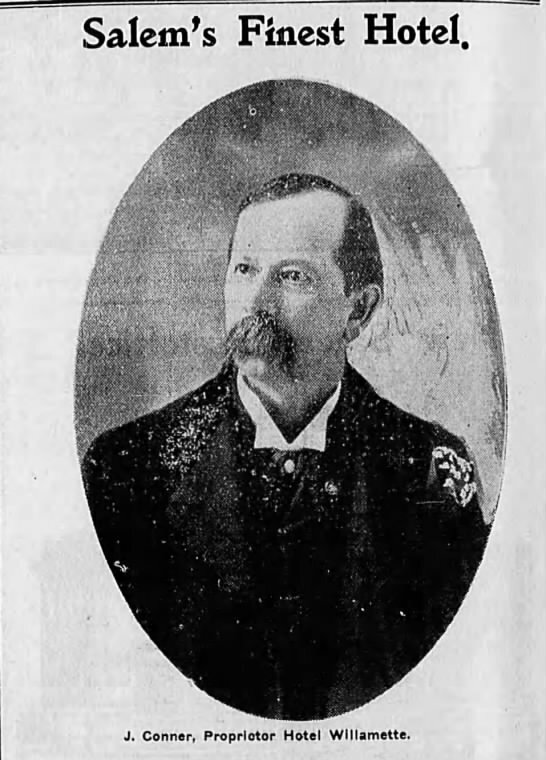 John Conner was born in Indiana in 1846 to William and Amelia Bolington Conner. He married his first wife Jerushia “Rush” Bolwine in LaBette, Kansas on January 12, 1871. Four children were born to this union, two boys named Walter and Daniel, and two daughters, Alice and Eva. 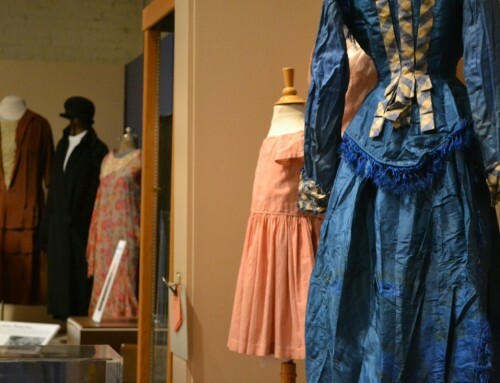 In 1875 the Conner family along with John’s parents and two of his brothers moved to Calistoga, California where John took employment with the Saratoga Springs Resort. John Conner, proprietor of the Willamette Hotel. 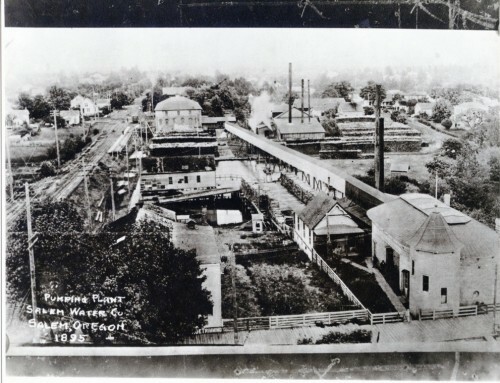 Photo credit: Capital Journal 24 Dec 1902. After the death of his infant daughter Eva and wife in 1888 John married Nellie Emerson. Looking for a fresh start and new opportunities, John moved his family north to Ashland, Oregon to take over the management of Hotel Oregon. 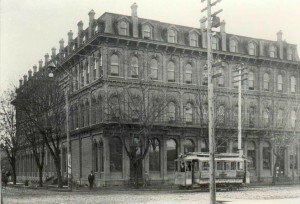 Here they remained for a few years until John received an offer he couldn’t refuse, the Hotel Willamette. Leaving his son Walter in charge of the Ashland property, John, Nellie, and daughter Alice moved to Salem. With investments in both the Hotel Oregon and Hotel Willamette, a beautiful home in Oakland, California, and stock ranch in southern Oregon the family did quite well for themselves financially. So in 1909 when the Hotel Willamette changed hands, John was ready to retire. He passed away November 14, 1920 in Oakland, California. 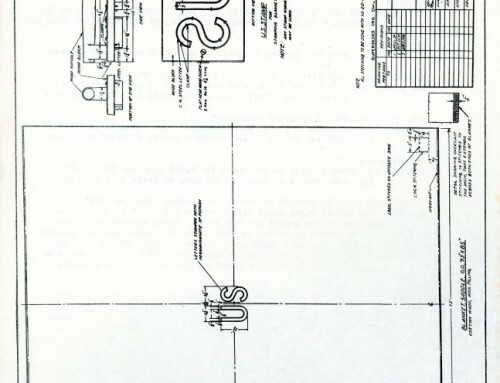 A rather quiet ending to a life lived on the grand scale running hotels and planning Thanksgiving dinners for hundreds.